However, the perennial question Buddhist thinkers have to deal with (if not out of their own curiosity, then because non-Buddhists are sure to raise it frequently) is: If there is no "self," how can there be continuity between incarnations? If there is reincarnation, shouldn't there be a "self" that connects one life to the next? How can a person be reborn as a completely different person? It would appear that one has to choose one option or the other, but cannot have both: either a person is reborn, in which case there must be some mechanism for the continuity of identity, or a different person is born right after the previous person died, and this new person for some reason has to tough out the karma earned by the previous person. The latter option seems both unreasonable and unfair, but the former option seems to be incompatible with the doctrine of anatta. We can make this question even more difficult, though not all schools of Buddhism go along with the following complication. It's hard enough to maintain the persistence of identity if we consider the rebirth of a person to be simultaneous with the instant of his death, but the puzzle gets even trickier if we believe that there is a time interval between lives. Sthaviravada (Theravada) Buddhists did not believe in an intermediate state, but some of the other early Hinayana schools did. For example, Sarvastivadins held to the notion of a separate stage of life-between-lives, called antarabhava, a nirvana-like phase that could not last any longer than 49 days. Subsequently, most Mahayana schools accepted the notion and elaborated on it in a great amount of detail. Most famously, Tibetan Buddhism called that state bardo, and it became the subject of the famous Tibetan Book of the Dead, Bardo Thodol. If there is such a thing as antarabhava, the question of who or what occupies that state between lives becomes even more urgent. There is no such thing as a person. The words "person" or "self" should not be used at all if at all possible. However, in reality it often would be difficult to avoid using such terms altogether, and thus, as we do so, we must remember that they don't name any real substances. These expressions are similar to the common talk of, say, a city's "greater metropolitan area." This phrase roughly refers to the city itself and the urban areas surrounding it (in the U.S. perhaps to those towns that receive the city's local television channels), but it's actually a flexible expression that helps us put a vague word on a vague, though sometimes useful, concept. In the final analysis it's a useful fiction. "Person" or "self" are words referring to an aggregate of various components. These components contribute to the aggregate, but the aggregate is not a separate thing over and above its component parts. In a famous illustration (to which we will return later, probably several more times) one can see and name all of the parts of chariot,2 and the chariot is not an additional thing over and above the components. 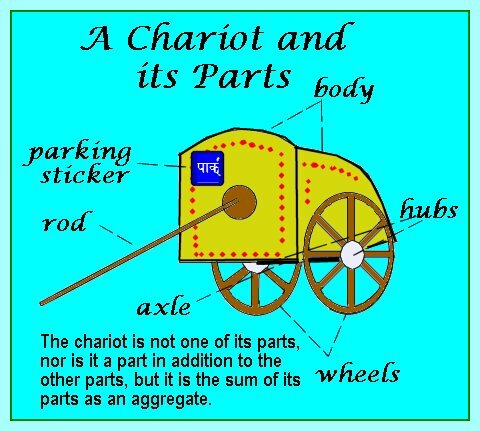 By the time that you have listed all of the parts of a chariot (pole, axle, wheels, framework, etc), you cannot add "chariot" to the list. It's not a component like the other parts, but it's what you get if and only if all the components are put together. Similarly, the "self" is a collection of components, and one should not think of the self as though it were logically equal to its components. Similarly to the previous option, the term "self" has no reality of its own and merely refers to an aggregate of components, but there is a substrate that serves to hold things together during the time of the antarabhava. The self is still an aggregate of components, but holding it together at all times, not just during antarabhava, is an abiding personal self, which is however neither identical with nor different from the components. (Don't worry if you have a hard time figuring out the logic of the last part; it's deliberately phrased so that one cannot pin down precisely what it means). 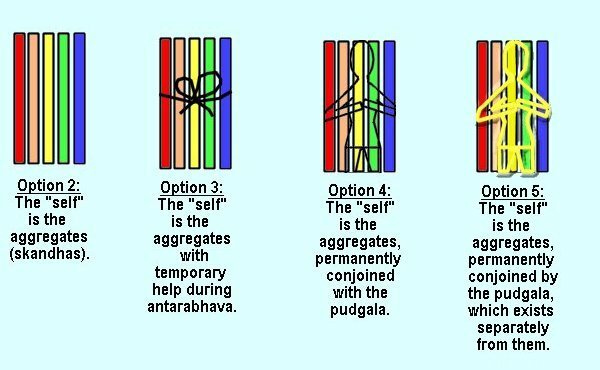 In a slight, but highly crucial variations on the above option, the self is still an aggregate of components, and holding it together at all times, not just during antarabhava, is an abiding personal self, which is distinct from the components. The first position appears to be the preferred one in some of the Buddha's early teachings, but the second and third one were the norm for most of the early Hinayana schools. The fourth one is the subject of this page, to clarify the contrast to Theravada. We need to add one more item of vocabulary, and that is "pudgala," which--for now--we can think of as meaning "person," but look for qualifications below. Since the point of this page is to describe the emergence of Pugdalavadin Buddhism in order to provide the setting in which the Theravada school grew and maintained itself, an elaboration on the skandhas needs to wait a little longer. For our present purposes, we have merely now acquired some nomenclature for the corresponding "parts of the chariot." The "self" is the aggregate of the five skandhas ("the aggregate of the five aggregates"), just as the chariot is the sum of its parts and not another thing alongside the parts. Please note that this analogy applies in each of the options 2, 3, and 4, since option 3 and 4 merely supply additions to option 2, but are not changing the scheme. Option 5 is seriously different. Option 1 does not lend itself to diagramming. Option 2 represents the 5 skandhas together, and that is all there is to the "self." Option 4 shows how a few schools pictured the matter. They maintained the concept of the 5 skandhas, but also insisted that there was a personal substrate, a pudgala, that served as preserver of a person's identity at all times (not just during antarabhava), and thus also kept the skandhas together, but, as noted earlier, its relationship to the skandhas could not be pinned down with clear logic. The earliest such school was called Vatsiputriya, named after its founder, Vatsiputra. He completely rewrote the third basket, the Abidhamma Pitaka (the one that explicates the teachings (Sutta Pitaka) and the monastic practice (Vinaya Pitaka). In the process, he simply could not reconcile a person's continued identity with the idea that there was nothing that guaranteed cohesion of their skandhas. That issue per se was being disputed among the various schools, as we have tried to show, but what made Vatsiputra's solution particularly contentious was that he concluded that something that serves as the organizing principle of a person's attributes must be personal. Thus, he advocated the notion of the pudgala, the "person" who bore the identity of a person throughout his many lives. We must be careful not to run too far or too fast with this concept. Vatsiputra himself was apparently not sure how to understand the pudgala. It appears that he said that it was neither identical with nor different from the skandhas, a clarification that does not clear up anything. (And, by the way, declaring it to be beyond logic because it is "transcendental" is a kind and courteous gesture, but does not help us understand it any further either.) One thing is for sure, though: the pudgala of the Vatsiputriyas was not intended to be anything like a "self" in the Hindu or Jain senses. It was neither the ego of a person, nor the center of one's being (there still wasn't one), let alone a self-existent soul It was simply the personal substrate (or, alternatively, the personalizing framework) that held someone's skandhas together. At that, this notion went a lot further than most other schools were willing to countenance. For them, even including the Sarvastivadins, the idea came far too close to the Hindu notion of Atman. As Buddhist schools tend to do, the Vatsiputriyans split, with their ultimate offspring being four personalist (or Pudgalavadin) schools. The largest one of these groups was the Sammatiya School, which is represented by option 5. Their distinctive over other Pudgalavadins was that they were willing to cross the line even further and do away with the Vatsiputriyin ambiguity concerning the pudgala. They just went ahead and asserted that it was distinct from the five skandhas. This was an audacious statement. Again, that idea did not turn the pudgala into a substantial self, but it certainly allowed for a self that was theoretically independent of the skandhas, and thereby it seriously put in question the conceptualization illustrated by the chariot, which had become virtually canonical. The Sammmatiyadins were considered to be heretical by most other Hinayana schools as well as the emerging Mahayana and Vajrayana schools. To put it mildly, there was a lot of harsh polemic against them, and they countered with their own vitriol. Still, the Pudgalavadin schools suffered the same fate as the Sarvastivadins and all of the other Hinayana and Mahayana schools in India. As Buddhism in all of its forms died out in its land of birth and early adulthood, they could not export themselves anywhere else. What was orthodox among them had been adopted and furthered in Mahayana schools; their central core of personalism was not acceptable to Mahayana any more than to its earlier Hinayana competitors. And then--this time for real--there was only one. Of all of the early Hinayana schools, only Theravada had survived, with its largest number of practitioners being located in Sri Lanka. ---- Or was there? Actually, not really. Sthaviravada, as it lived and flourished in Sri Lanka, wound up giving birth to several competing branches, and Theravada, as we know it now, has survived some acrimonious disputes in the religious history of the island. However, we would not gain much more insight by spending any further time on splinter movements, and we will now, on this part of the website, focus directly on Theravada. 1In many ways this same discussion could be generalized regarding other metaphysical concepts, such as the notion of "being." Back to text. 2This example comes up several times in Buddhist literature. Its most famous occurrence is in The Questions of King Milinda, tranlated by T. W. Rhys Davis in Sacred Books of the East, 35:45. Back to text. 3 Buddhist Dictionary of the Buddhist Door. URL: http://glossary.buddhistdoor.com/en/word/15458/antarabhava Back to text. 4Bhikshu Thich Thien Chau and Sarah Boin-Webb (trans. ), Literature of the Personalists of Early Buddhism. Buddhist Tradition Series, Volume 39 (Mumbai: Motilal Banarsidas, 1999). Back to text.